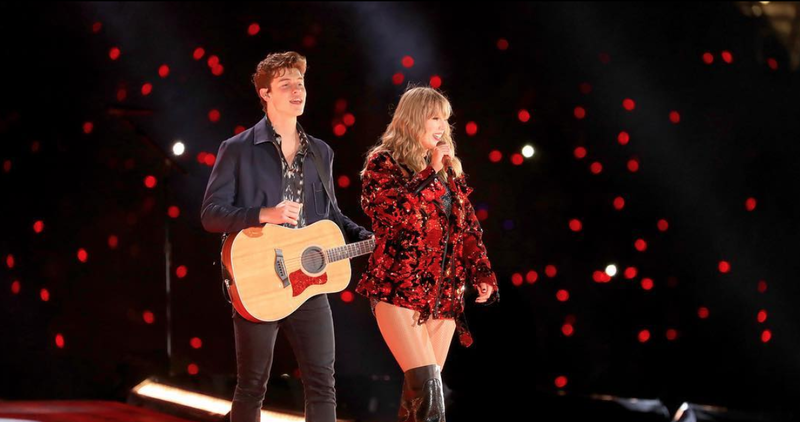 Last weekend, Shawn Mendes and Taylor Swift pulled off a big surprise for their fans. “I’m gonna sing a little bit of a song, and as soon as you recognize it, if you love it as much as I do,” she teased her crowd of 60,000. “Start screaming, singing along, or combine the two and start screaming along. And if you do that, something cool might happen. Ready to play the game?" As she sang, Taylor welcomed Shawn out as a special guest. Together they performed “There’s Nothing Holding Me Back” at Pasadena, California’s Rose Bowl. Mendes, who was the opener on Swift’s last tour, 1989, fit right in on stage performing with Swift. On the red carpet at the Billboard Music Awards, Mendes talked with E! News’ Jason Kennedy about the “unbelievable” experience it was to perform with her. “It was awesome to be back and be with her,” he shared. "It's a very different thing to be brought out, special guest from opening. Unreal, man. I wish you could experience what it feels like." They both exchanged thank you’s to each other on Instagram. Now we can’t help but wish “A Little Too Much” that Mendes will bring out some special guests on his tour, which will stop right here in Sacramento in July of 2019. Don't forget to check out his new selt-titled album, Shawn Mendes, which drops this Friday!